Barangay Ginebra claimed their first Manila Clasico win over the Magnolia Hotshots. They gutted out a tough 97-93 OT win over their rivals. Ginebra stays in contention for a top two spot with a 5-3 record. Ginebra also send the Hotshots to the edge of the playoff picture with their fifth loss in eight games. On the night where Ginebra superstar LA Tenorio passed Purefoods legend Alvin Patrimonio for most consecutive games played at 597, it was the young stars that showcased their skills. Scottie Thompson came off the bench for a career-high 27 points. He had 11 rebounds and four assists to go along with his scoring total. Thompson dueled with Jio Jalalon who scored 22 off the bench for Magnolia. Thompson powered the Barangay early in the game. He closed the first period with six straight points, turning a two-point deficit into a four-point lead heading into the second period. Kevin Ferrer and Art Dela Cruz followed Thomspon’s lead and scored nine straight points to open the second quarter. That 15-0 blast to bridge both quarters gave Ginebra a 13-point advantage. They would settle for a nine-point lead heading into the half. An energized Magnolia squad came out firing in the third period. Mark Barroca, Ian Sangalang and Paul Lee scored eight straight points to open the third period, cutting the deficit down to one. Then Jalalon went on his own scoring barrage. 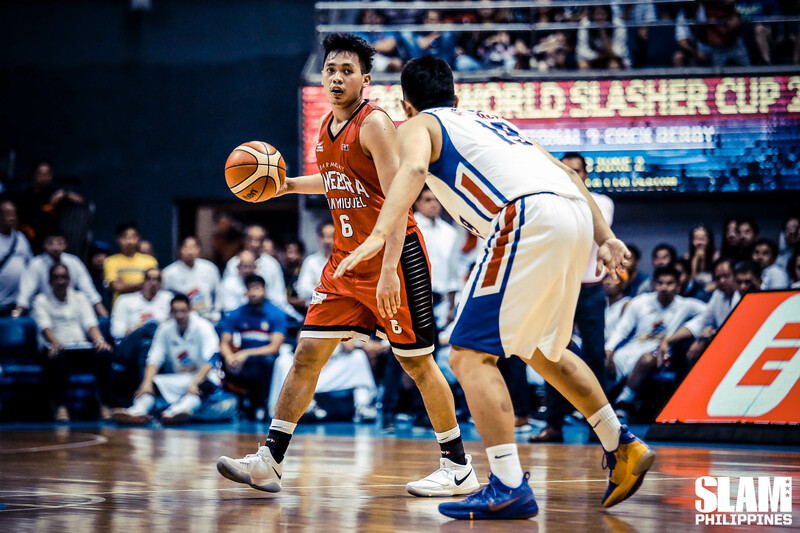 The pint-sized whirlwind carried Magnolia’s offense, preventing Ginebra from pulling away once agian. The game stayed tight all the way to the final minutes of regulation. In the final minute of the fourth period, Japeth Aguilar nailed a jumper in the paint to give Ginebra a six-point lead. Jalalon answered that shot right back with a three-pointer to keep Magnolia in the game. Ginebra had a chance to ice the game. They swung the ball around the perimeter and found Sol Mercado on the right wing. Mercado rose for a three-pointer but was met at the top by Barroca. Magnolia recovered the ball and pushed it up to their attack zone. Barroca found Jalalon at the top of the key. From thirty feet away, Jalalon launched a three-pointer that tied the game at 85. Tenorio missed the pull-up jumper at the buzzer, sending the game to OT. The Hotshots couldn’t keep up with the Barangay in OT. Tenorio opened the extra period with a layup and Greg Slaughter scored in the paint. Thompson hit a booming three-pointer with 1:56 left in the game to put Ginebra up by two possessions. The dagger came when Aguilar intercepted a lob for Sangalang on the defensive end and sprinted all the way to the hoop to get the pass from Thompson for the exclamation point dunk. In the first game, the NLEX Road Warriors thumped the Blackwater Elite, 122-101, for their second straight win. NLEX rises up to sixth place with a 4-5 record while Blackwater stays at the bottom of the standings with a 2-8 slate. Philip Paniamogan came off the bench to fire 25 points on 61% shooting. JP Erram had 20 points and 10 rebounds against his former team. Bong Galanza and Kenneth Ighalo had 18 and 17, respectively. Allein Maliksi led Blackwater with 20 points. The Road Warriors were on fire from beyond the arc in the game. They erupted for 21 three-pointers on nearly 40% shooting. Paniamogan and Ighalo both shot 5/8 from beyond the arc. Galanza led the team with 6/11 shooting from the outside. Four other players nailed at least one three-pointer. After a tight first period, the Road Warriors pulled away for good in the middle quarters. 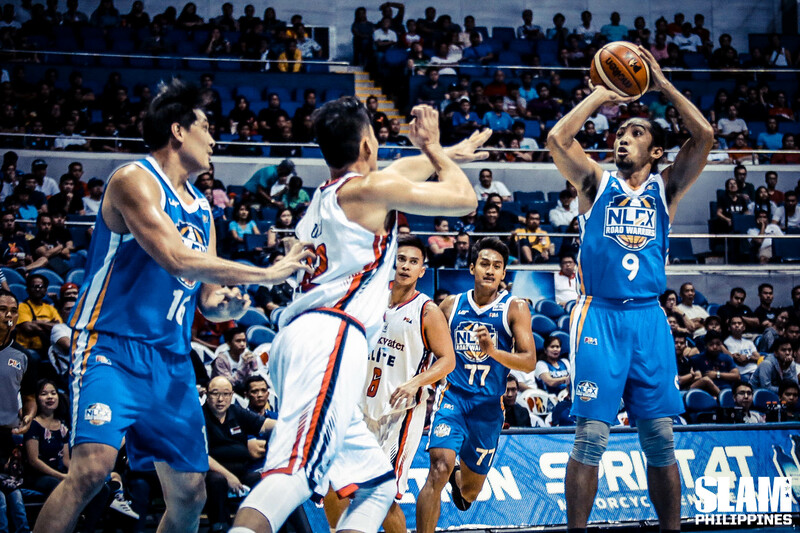 NLEX built a 15-point lead after falling behind by two points early in the second quarter. They got key buckets from Galanza, Ighalo and Erram to power their run. In the third period, Paniamogan caught fire. He dropped 12 straight points midway through the quarter to push NLEX’s lead up to 25. His layup with a little less than five minutes left gave Blackwater a 29-point lead, their biggest of the game. That cushion was too much for Blackwater to overcome.